It was supposed to be a glorious winter wonderland. Unfortunately, for many, it feels like the Grinch swooped in and stole Christmas. Our area has been bracing for a winter storm for several days now. Our local media stations reported on the arrival of Winter Storm Grayson non-stop. Public safety outlets prepared for the collisions that would undoubtedly happen due to inexperienced winter drivers on the roads. Emergency management personnel worked around the clock to inform the organizations they work for about the intricacies of the storm so officials could make the best decisions about ceasing/continuing operations. Even social media professionals (cough, cough) worked hard to let their audiences know about closures and delays. In terms of hysteria, this winter storm was right on par with your typical hurricane. 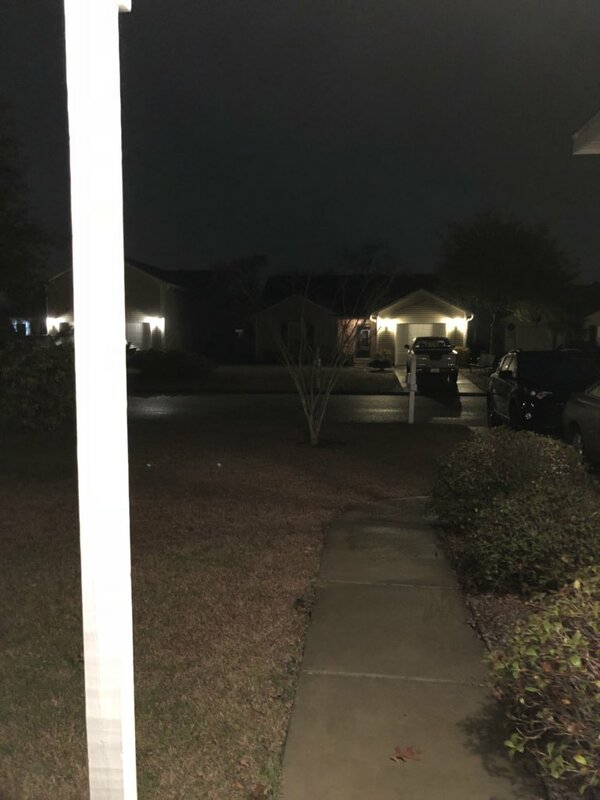 However, instead of taking precautions to battle a tropical storm that can bring deadly winds, flooding rain, and violent destruction, we were bracing for 1-3 inches of snow. To my friends out west, laugh all you want. Yes, we call that amount of snow a “dusting” where I am from, but I completely understand why people out here were calling it “Snowmageddon.” You see, these winter events typically don’t happen in the south. Most adults around these parts who have lived in the area most of their lives can count on one hand the amount of times they have seen snow. Most years, South Carolina is shielded from the white stuff and citizens don’t have to worry about the havoc and inconvenience it creates. Driving in snow? Removing snow? Dressing for snow? These are usually not concerns. Sidney and I have listened to countless people joke with us the past two days…looks like you guys brought the snow with you from Spokane. 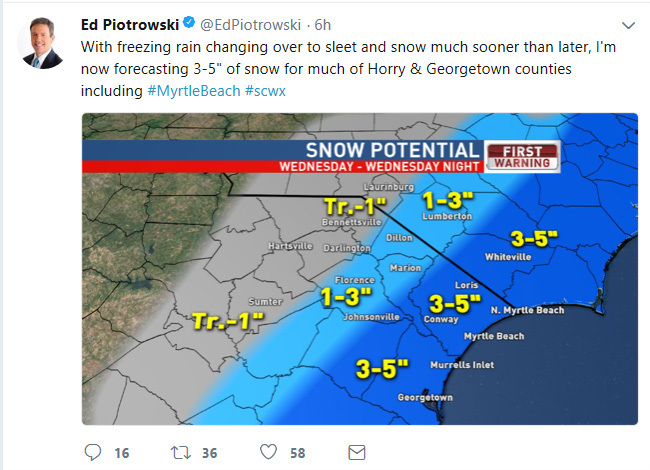 Well, I don’t know if we can take credit for giving Myrtle Beach hope for its first actual snow accumulation in eight years but I do admit, it is kind of ironic. However, half of me kept wishing that we did leave it out in Washington. Personally, I hate snow. 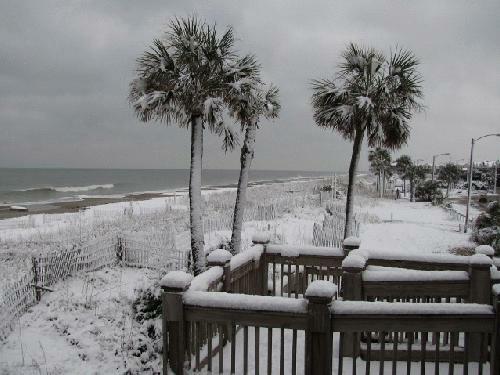 In 2010, Myrtle Beach received snow accumulaton. But many people out here don’t share my sentiment, or at least think they don’t. It was a very exciting time for Myrtle Beach residents as they anticipated a weather pattern completely out of the norm. Folks down here were straight up giddy. It looked as if a late holiday present was coming. So, while half of me didn’t want to see a single snowflake drop, the other half was hoping my friends down here would get their wish. As the week went on, the forecast for snow kept increasing. By Tuesday night, it was a certainty that our area would be covered in a white blanket. The confidence this morning only grew. Once the day transitioned to the afternoon, our meteorologists had decided to up the ante. We would not get 1-3 inches; instead, we would get 3-5 inches! By this afternoon, we were supposed to get between 3 – 5 inches of snow. We ended up getting nothing. The local news told us the snow would arrive at 3 p.m. But it didn’t. They moved the time back to 4 p.m. Nothing. It was adjusted to 5 p.m. Then 6 p.m. at the very latest. Still nada. Some weather people put out a last-ditch estimate for the snow to start at 7 p.m. When that deadline came and passed with absolutely no snow fall, the meteorologists conceded that it was a “busted” forecast. After all that, Myrtle Beach would not see snow. 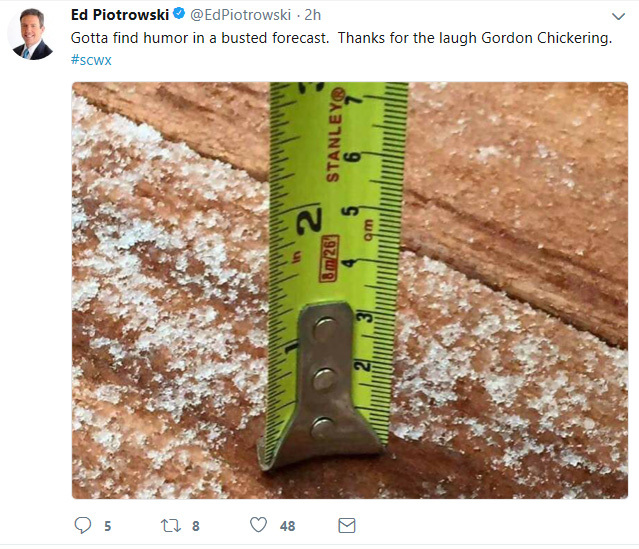 I found this tweet from popular meteorologist Ed Piotrowski of ABC 15 very funny and also humbling. So even though I didn’t move to Myrtle Beach to see snow, I still feel bad for my friends and family who really hoped to experience it. There was a lot of buildup and excitement that never materialized. I also feel bad for the meteorologists. They work so hard and put forth a lot of effort forecasting this storm. I know they wanted to deliver on the snow but no one can completely predict the crazy turns the weather will take. The snow that was supposed to come as early as 3 p.m. never came at all. If there is any consolation for the Myrtle Beach children who saw their hopes dissolve this evening, it is that they get another day off tomorrow. Although we didn’t get snow, we got a lot of ice. Thus, in addition to the “snow day” they got today, Horry County School students will get one tomorrow as well. Of course that means if the students don’t have school, neither does Sidney. But it won’t just be Sid and Sloan spending the day together. The Coastal Carolina University campus is closed due to the weather so I will be working remotely in the comfort of our own home. Although I am not a fan of snow days, I am doing the best I can to enjoy the time off with my girls. As I look outside of my house right now, we have absolutely no snow. Stay safe, everyone. I hope the people in the towns surrounding Myrtle Beach who did receive snow enjoy it. To those individuals going to bed this evening disappointed, don’t get too bent out of shape – snow really isn’t that great. Don’t Blink.